The tide of National Novel Writing Month is upon us. Are you getting into storytelling ship and setting out on the turbulent sea? Or are you staying on shore, watching other mad sailors disappear over the horizon, sink under the waves? 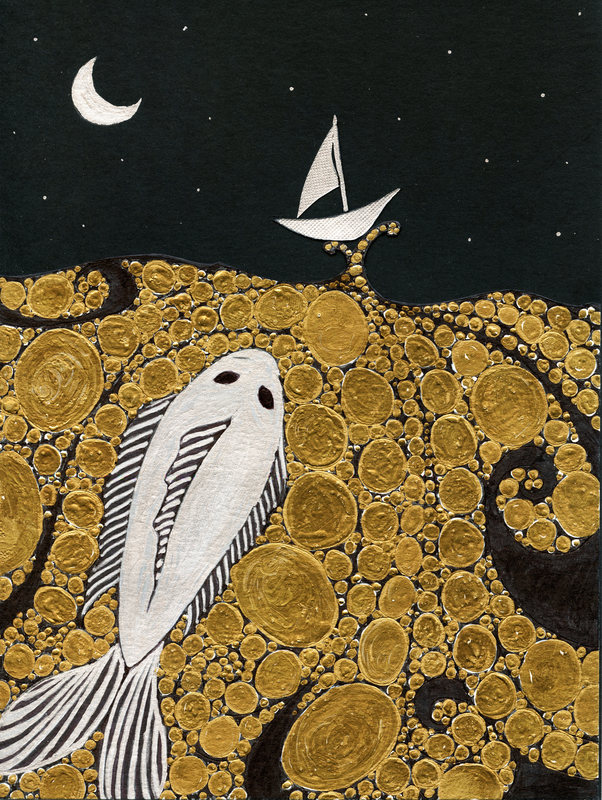 Perhaps the metaphor is wrong, but it went with my gold ocean up there. I love NaNoWriMo. I first gave it a try in 2004. I’ve missed only two years since. Let me say, I am not trying to convince you to jump in. Don’t explain why NaNoWriMo doesn’t work for you. You know yourself and what works for you. Depending on how you write, NaNo is a terrible thing. You may already be in the middle of a novel and don’t need NaNo. The pace may not work for your schedule. You may not be a joiner. You may think it is a waste of time. You may hate the mess you have at the end, preferring time for research and rewriting. You may be a perfectionist. Whatever. Love what you love. Write the way that works for you. Don’t explain. I’m writing why I participate in NaNo for anyone who wonders if they’d like to journey alongside. I’ve never seen myself as a joiner. My dad put me in Girl Scouts. Ugh. Hated every single meeting. He put me in Girls’ Club. I hated that too. Clubs in school? Tried. Never went to meetings. Sororities? You’ve got to be kidding. No. Team building retreats? Torment. I’ve often been much happier home alone than at a party. But NaNoWriMo is different. Well, I became good friends with the woman in charge of NaNo events here. I sometimes helped set up write-ins. I even hosted a few. I’ve heard stories of other regions where the Municipal Liaisons (the persons in charge of a region and who communicate directly with the head NaNo office) are terrible organizers, cliquish, unfriendly, or in some way not suited for the task. Our ML here was amazing and supportive. She planned great events. That makes a difference. It’s unpaid gig after all. I laugh quietly when I overhear two writers in line for coffee talking about the different ways to kill people in a horror story. The people I’ve met at write-ins are very often people I could’ve been friends with in high school. These are English majors, bookish people, nerds, oddballs, and Whovians. Of course, there are accountants, police officers, computer engineers, and others, but they love stories and characters and spending time lost in their own created worlds. Sure, some NaNo-ers set out with unrealistic expectations. They don’t know what it takes to write a publishable novel or they don’t know what it takes to be published. So? They’ll discover if writing is what they really want to do. They’ll meet other writers. They’ll try to do something that they’ve always talked about. Many people say they want to write a novel, but they never put one word to paper. I’ve heard critics say, “NaNo is a waste of time.” I suppose. But how many things we take part in are a waste of time? Most people are changing the world or saving lives in their free time. Most people are spending too much time on Facebook or binge watching shows on Netflix. I’m reminded me of an expression (source long forgotten) that says something long the lines of, “What’s important to me has meaning. What’s important to you but not to me is meaningless.” Personally, I love witnessing people passionate about what they’re doing. Are they writing the great American novel? Maybe. Maybe not. Does it matter? The challenge of NaNoWriMo motivates me. I let go of the small stuff. The word goal focuses my mind, makes me stow distractions away below deck. The story gets written in its unholy mess. And I continue to work on during the year. Then I ponder every word choice and plot point. I straighten out the mess. Other ideas show up ready to take a journey of their own by the time November rolls around again. This year I’m working on a story titled, The Book of Astrophilia. We’ll see where it takes us. Are you NaNo-ing? Then bon voyage! Tell me about your travels. Well said! For me, NaNo is definitely about the challenge and the excitement of sharing creative energy with a roomful of fellow writers. I went all in with my first NaNo last year and loved it. Unfortunately, the ML for our region turned out to be pretty egotistical and unpleasant, so I’m not feeling as enthusiastic about attending write-ins she’ll be at this year. That’s unfortunate about your ML. A terrible ML can ruin the experience. But go to other events and have fun. Good luck with the writing!